Model of the eukaryotic translation elongation pathway. Model of the eukaryotic translation elongation pathway. In this model the large ribosomal subunit is drawn transparent to visualize tRNAs, factors, and mRNA binding to the decoding center at the interface between the large and small subunits and tRNAs interacting with the peptidyl transferase center in the large subunit. 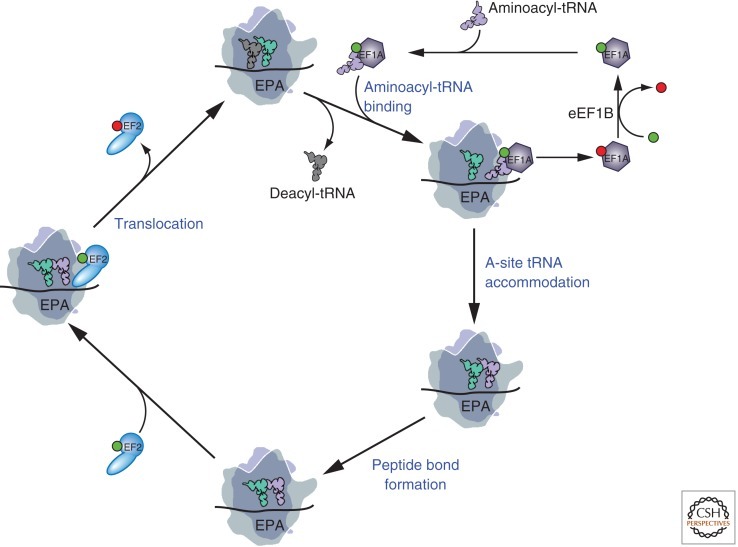 Starting at the top, an eEF1A-GTP-aminoacyl-tRNA ternary complex binds the aminoacyl-tRNA to the 80S ribosome with the anticodon loop of the tRNA in contact with the mRNA in the A site of the small subunit. Following release of eEF1A-GDP, the aminoacyl-tRNA is accommodated into the A site, and the eEF1A-GDP is recycled to eEF1A-GTP by the exchange factor eEF1B. Peptide bond formation is accompanied by transition of the A- and P-site tRNAs into hybrid states with the acceptors ends of the tRNAs moving to the P and E sites, respectively. Binding of eEF2-GTP promotes translocation of the tRNAs into the canonical P and E sites, and is followed by release of eEF2-GDP, which unlike eEF1A does not require an exchange factor. The ribosome is now ready for the next cycle of elongation with release of the deacylated tRNA from the E site and binding of the appropriate eEF1A-GTP-aminoacyl-tRNA to the A site. Throughout, GTP is depicted as a green ball and GDP as a red ball; also, the positions of the mRNA, tRNAs, and factors are drawn for clarity and are not meant to specify their exact places on the ribosome (Dever, 2012). which binds the poly(A) tail, circularizing and activating the bound mRNA. In eukaryotic cells degradation of bulk mRNA in the 5' to 3' direction requires the consecutive action of the decapping complex (consisting of DCP1 and DCP2) and the 5' to 3' exonuclease XRN1 (Pacman). These enzymes are found in discrete cytoplasmic foci known as P-bodies or GW-bodies (because of the accumulation of the GW182 antigen). Proteins acting in other post-transcriptional processes have also been localized to P-bodies. These include SMG5, SMG7, and UPF1, which function in nonsense-mediated mRNA decay (NMD), and the Argonaute proteins, which are essential for RNA interference (RNAi) and the micro-RNA (miRNA) pathway. In addition, XRN1 is required for degradation of mRNAs targeted by NMD and RNAi. To investigate a possible interplay between P-bodies and these post-transcriptional, processes P-body or essential pathway components were depleted from Drosophila cells and the effects of these depletions were analyzed on the expression of reporter constructs, allowing specific monitoring of NMD, RNAi, or miRNA function. The RNA-binding protein GW182 and the DCP1:DCP2 decapping complex are required for miRNA-mediated gene silencing, uncovering a crucial role for P-body components in the miRNA pathway. This analysis also revealed that inhibition of one pathway by depletion of its key effectors does not prevent the functioning of the other pathways, suggesting a lack of interdependence in Drosophila (Rehwinkel, 2005). In eukaryotic cells, bulk messenger RNA (mRNA) is degraded via two alternative pathways, each of which is initiated by the removal of the poly(A) tail by deadenylases. Following this first step, mRNAs can be degraded from their 3' ends by the exosome, a multimeric complex of 3' to 5' exonucleases. Alternatively, after deadenylation, the cap structure is removed by the DCP1:DCP2 decapping complex, and the mRNA is degraded by the major cytoplasmic 5' to 3' exonuclease XRN1 (Rehwinkel, 2005). Proteins required for 5' to 3' mRNA degradation (e.g., DCP1, DCP2, and XRN1) colocalize in specialized cytoplasmic bodies or mRNA decay foci, also known as mRNA processing bodies (P-bodies) or GW-bodies, because of the accumulation of the RNA binding protein GW182 in these bodies. Additional components of P-bodies in yeast and/or human cells include the deadenylase Ccr4, the cap binding protein eIF4E and its binding partner eIF4E-transporter (eIF4E-T), auxiliary decay factors such as the LSm1-7 complex, Pat1p/Mtr1p, and the putative RNA helicase Dhh1/rck/p54. Among these, human GW182, eIF4E-T, and Dhh1 are required for P-body formation, while the decapping enzymes and XRN1 are dispensable. In addition, mRNA decay intermediates, microRNA (miRNA) targets, and miRNAs have been localized to P-bodies, suggesting that these bodies are sites where translationally silenced mRNAs are stored before undergoing decay (Rehwinkel, 2005 and references therein). Recently, proteins involved in other post-transcriptional processes have been localized to P-bodies in human cells. These include the proteins SMG5, SMG7, and UPF1 involved in the nonsense-mediated mRNA decay (NMD) pathway and the Argonaute (AGO) proteins that play essential roles in RNA silencing. Moreover, XRN1 is recruited by both the NMD and the RNA interference (RNAi) machineries to degrade targeted mRNAs, suggesting a possible link between NMD, RNAi, and P-bodies. NMD is an mRNA quality control (or surveillance) mechanism that degrades aberrant mRNAs having premature translation termination codons (PTCs), thereby preventing the synthesis of truncated and potentially harmful proteins. Core components of the NMD machinery include the proteins UPF1, UPF2, and UPF3, which form a complex whose function in NMD is conserved. The activity of UPF1 is regulated in multicellular organisms by additional proteins (i.e., SMG1, SMG5, SMG6, and SMG7) that are also required for NMD in all organisms in which orthologs have been characterized (Rehwinkel, 2005 and references therein). In yeast and human cells, a major decay pathway for NMD substrates involves decapping and 5' to 3' degradation by XRN1. Although degradation of nonsense transcripts in Drosophila is initiated by endonucleolytic cleavage near the PTC, the resulting 3' decay intermediate is also degraded by XRN1. A molecular link between the NMD machinery and the decay enzymes localized in P-bodies is provided by SMG7 in human cells. Indeed, when overexpressed, human SMG7 localizes in P-bodies and recruits both UPF1 and SMG5 to these bodies, suggesting that NMD factors may reside at least transiently in P-bodies. RNA silencing pathways are evolutionarily conserved mechanisms that elicit decay or translational repression of mRNAs selected on the basis of complementarity with small interfering RNAs (siRNAs) or miRNAs, respectively. siRNAs are fully complementary to their targets and elicit mRNA degradation via the RNAi pathway. Animal miRNAs are only partially complementary to their targets and do not generally elicit decay, but repress translation instead (Rehwinkel, 2005 and references therein). To perform their function, the siRNAs and miRNAs associate with the AGO proteins to form multimeric RNA-induced silencing complexes (RISC). Drosophila AGO1 mediates miRNA function, while AGO2 catalyzes the endonucleoytic cleavage of siRNA targets within the region complementary to the siRNA. Following this initial cleavage, the resulting 5' mRNA fragment is degraded by the exosome, while the 3' fragment is degraded by XRN1. The localization of AGO proteins in P-bodies in human cells provides a possible link between these bodies and silencing pathways (Rehwinkel, 2005 and references therein). The NMD, the siRNA, and the miRNA pathways are therefore interlinked by the use of common decay enzymes and/or the coexistence of components of these pathways in P-bodies, suggesting a possible interdependence between these post-transcriptional mechanisms. Evidence for a link between NMD and RNAi has been reported in Caenorhabditis elegans where UPF1, SMG5, and SMG6 are required for persistence of RNAi, though not to initiate silencing. In contrast, UPF2, UPF3, and SMG1, which are also essential for NMD, are not required to maintain silencing, suggesting that UPF1, SMG5, and SMG6 may have evolved specialized functions in RNAi (Rehwinkel, 2005 and references therein). This study investigates the interplay between NMD, RNAi, and the miRNA pathway using the Drosophila Schneider cell line 2 (S2 cells) expressing reporters allowing the monitoring of NMD, RNAi, or miRNA function. To this end, factors involved in NMD (UPF1, UPF2, UPF3, SMG1, SMG5, and SMG6), RNAi (AGO2), or the miRNA pathway (AGO1) were depleted and the effect on the expression of the reporters analyzed. These proteins showed a high degree of functional specificity. To determine the role of P-body components in these pathways the DCP1:DCP2 decapping complex, the decapping coactivators LSm1 and LSm3, the 5' to 3' exonuclease XRN1, GW182, and the Drosophila protein CG32016, which shares limited sequence homology with human eIF4E-T, were depleted. The results uncovered a crucial role for GW182 and the DCP1:DCP2 decapping complex in the miRNA pathway (Rehwinkel, 2005). Components of the NMD, RNAi, and miRNA pathways exhibit functional specificity in Drosophila To investigate a potential role of components of RNA silencing pathways or of P-body components in NMD, use was made of cell lines expressing wild-type or PTC-containing reporter constructs in which the coding regions of the bacterial chloramphenicol acetyl transferase (CAT) or the Drosophila alcohol dehydrogenase (adh) genes were placed downstream of inducible or constitutive promoters. The PTCs were inserted at codon 72 and 83 of the CAT and adh open reading frames, respectively. P-body components and proteins involved in NMD, RNAi, or the miRNA pathway were depleted by treating the cells with double-stranded RNAs (dsRNAs) specific for the different factors. A dsRNA that targets green fluorescent protein (GFP) served as a control. The steady-state levels of the wild-type and PTC-containing mRNAs were analyzed by Northern blot and normalized to those of the endogenous rp49 mRNA (encoding ribosomal protein L32) (Rehwinkel, 2005). Relative to the expression levels of the wild-type mRNAs, the levels of the corresponding PTC-containing transcripts are reduced because these transcripts are rapidly degraded via the NMD pathway. Depletion of UPF1 inhibits NMD, so the levels of the PTC-containing mRNAs are restored. Depletion of AGO1 or AGO2, both singly and in combination, does not interfere with the NMD pathway, although these depletions do inhibit siRNA- or miRNA-mediated gene silencing. The levels of the CAT wild-type transcript were not affected by the depletions. Similar results were obtained with the NMD reporter based on the adh gene. Together, these results indicate that inhibition of RNAi or of the miRNA pathway does not interfere with NMD. XRN1 is the only P-body component known to be required for degradation of decay intermediates arising from mRNAs undergoing NMD in Drosophila. Nevertheless, in cells depleted of XRN1 the NMD pathway is not inhibited, and only the 3' decay intermediate generated by endonucleolytic cleavage of the mRNA accumulates (Rehwinkel, 2005). In contrast to XRN1, none of the P-body components tested, including GW182 and the DCP1:DCP2 decapping complex, affected NMD or the accumulation of the 3' decay intermediate. The lack of a significant effect of the depletion of the DCP1:DCP2 complex was confirmed using the adh reporter. The decapping enzymes are certainly involved in NMD in yeast and human cells because the major decay pathway for NMD substrates is initiated by decapping in these organisms (for review, see Conti, 2005). Thus, it is possible that the requirement for P-body components and/or P-body integrity in NMD varies across species (Rehwinkel, 2005). Two different approaches were used to investigate the RNAi pathway. In one approach, a cell line constitutively expressing the wild-type Drosophila adh gene was treated with a dsRNA complementary to a central region of ~300 nucleotides (nt) of adh mRNA (adh dsRNA). This dsRNA elicits decay of the adh mRNA via the RNAi pathway. Cells were treated with dsRNAs targeting various factors in the presence or absence of adh dsRNA. The steady-state levels of the adh mRNA were analyzed by Northern blot and normalized to those of the rp49 mRNA. In cells treated with GFP dsRNA, the normalized levels of the adh transcript were reduced to 4% after addition of adh dsRNA, relative to the levels detected in the absence of adh dsRNA. In cells depleted of AGO2, a sixfold increase of adh mRNA levels was observed despite the presence of adh dsRNA. In contrast, when AGO1 was depleted, adh dsRNA could still trigger a reduction of adh mRNA levels, though a slight increase in transcript levels was observed. Similarly, depletion of UPF1 did not prevent silencing of adh expression by adh dsRNA. These results indicate that UPF1 is not required for RNAi in Drosophila. Additional NMD components (i.e., UPF2, UPF3, SMG1, SMG5, and SMG6) have been identified, but no SMG7 ortholog has been identified in Drosophila. No significant change was observed in the efficacy of RNAi under the conditions in which NMD was inhibited (Rehwinkel, 2005). Similarly to the results reported for the NMD pathway, depletion of XRN1 leads to the accumulation of the 3' decay intermediate generated by endonucleolytic cleavage by RISC, while depletion of the DCP1:DCP2 decapping complex does not prevent RNAi or the degradation the 3' decay intermediate. In contrast, depletion of GW182 leads to a modest increase in the adh mRNA level in the presence of adh dsRNA, suggesting that this protein could influence the efficiency of RNAi (Rehwinkel, 2005). In a second approach, RNAi was triggered by an siRNA instead of a long dsRNA, to uncouple RISC activity from processing of dsRNAs. To this end, S2 cells were transiently transfected with a plasmid expressing firefly luciferase (F-Luc) and an siRNA targeting the luciferase coding sequence (F-Luc siRNA) or a control siRNA. A plasmid encoding Renilla luciferase (RLuc) was included to normalize for transfection efficiencies. Cotransfection of the F-Luc reporter with the F-Luc siRNA led to a 50-fold inhibition of firefly luciferase activity relative to the activity measured when the control siRNA was cotransfected, indicating that F-Luc siRNA effectively silences firefly luciferase expression (Rehwinkel, 2005). The results obtained with the luciferase reporter correlate well with those obtained with adh mRNA, in spite of differences between the methods used to detect changes in reporter levels (RNA levels vs. protein levels), and the nature of the RNA trigger (long dsRNA vs. siRNA). Indeed, depletion of AGO2 impaired silencing of firefly luciferase expression by the F-Luc siRNA, leading to an eightfold increase in firefly luciferase activity relative to the activity of the Renilla control. Depletion of AGO1 led to a twofold increase of firefly luciferase activity (Rehwinkel, 2005). The observation that depletion of AGO2, but not AGO1, significantly inhibits RNAi is in agreement with previous reports showing that only AGO2-containing RISC is able to catalyze mRNA cleavage triggered by siRNAs. The results together with these observations indicate that Drosophila AGO1 and AGO2 are not redundant (Rehwinkel, 2005). Depletion of GW182 or the DCP1:DCP2 complex led to a 1.5- to twofold increase of the firefly luciferase activity, although RNAi was not abolished. These results together with those obtained with the adh reporter suggest that GW182 and the DCP1:DCP2 complex are not absolutely required for RNAi but may modulate siRNA function (Rehwinkel, 2005). Finally, depletion of core NMD components does not inhibit the silencing of firefly luciferase expression by F-Luc siRNA. The results are consistent with results from C. elegans showing that NMD per se is not required for the establishment of silencing (Rehwinkel, 2005). To investigate the miRNA pathway firefly luciferase reporters were generated in which the coding region of firefly luciferase is flanked by the 3' UTRs of the Drosophila genes CG10011 or Vha68-1. These genes were identified as miRNA targets in a genome-wide analysis of mRNAs regulated by AGO1. The 3' UTR of CG10011 mRNA contains two binding sites for miR-12, while the 3 UTR of Vha68-1 has two binding sites for miR-9b. Expression of the firefly luciferase construct fused to the 3' UTR of CG10011 (F-Luc-CG10011) was strongly reduced by cotransfection of a plasmid expressing the primary (pri) miR-12 transcript, but not pri-miR-9. Conversely, expression of the firefly luciferase reporter fused to the 3' UTR of Vha68-1 (FLuc-Vha68-1) was inhibited by cotransfection of pri-miR-9b, but not of primiR-12 (Rehwinkel, 2005). Silencing of luciferase expression by the cognate miRNAs was prevented in cells depleted of AGO1. Indeed, despite the presence of the transfected miRNAs, in cells depleted of AGO1 an 11-fold and a 16-fold increase of firefly luciferase expression was observed from the FLuc- CG10011 and F-Luc-Vha68-1 reporters, respectively. Notably, the firefly luciferase activity measured in AGO1-depleted cells in the presence of the transfected miRNAs was at least twofold higher than the activity measured in control cells in the absence of exogenously added miRNAs. Since endogenous miR-9b and miR-12 are expressed in S2 cells, these results suggest that depletion of AGO1 also suppresses silencing mediated by the endogenous miRNAs. Depletion of AGO2 does not suppress the effect of coexpressing the reporters with the cognate miRNAs. These results provide additional evidence supporting the conclusion that the siRNA and miRNA pathways are not interdependent (Rehwinkel, 2005). miRNA-mediated silencing of firefly luciferase expression was not affected by depletion of UPF1 or by the additional NMD factors (i.e., UPF2, UPF3, SMG1, SMG5, and SMG6). Thus, the individual NMD factors and NMD per se are not required for miRNA function. Unexpectedly, although the efficiency of NMD and RNAi was unaffected or only modestly affected in cells depleted of GW182 or the DCP1:DCP2 complex, miRNA-mediated silencing of firefly luciferase expression was effectively relieved in these cells. In the presence of cognate miRNAs, depletion of GW182 resulted in a sixfold increase of firefly luciferase expression. Therefore, despite the presence of transfected miRNAs, firefly luciferase activity in GW182-depleted cells was similar to that measured in controls cells in the absence of transfected miRNAs. Codepletion of DCP1 and DCP2 led to a fourfold increase of firefly luciferase expression. Finally, depletion of CG32016 resulted in a twofold increase of firefy luciferase activity, but only for the F-Luc-Vha68-1 reporter, suggesting that this effect may not be significant (Rehwinkel, 2005). To investigate whether depletion of GW182 affects RISC activity directly, as opposed to interfering with miRNA processing, use was made of a tethering assay. This assay involves the expression of a lN-fusion of AGO1 that binds with high affinity to five BoxB sites (5-BoxB) in the 3 UTR of a firefly luciferase reporter mRNA. When AGO1 is tethered to this reporter transcript, luciferase expression is inhibited relative to the activity measured in cells expressing the lN-peptide alone. The inhibition was partially relieved in cells depleted of GW182 but not of AGO2. It is concluded that GW182 and the decapping DCP1: DCP2 complex play a critical role in the effector step of the miRNA pathway. These results are in agreement with the observation that Argonaute proteins localize to P-bodies and interact with DCP1 and DCP2 independently of RNA or of P-body integrity (Rehwinkel, 2005). Thus, despite convergence in P-bodies, NMD, RNAi, and the miRNA pathway are not interdependent in Drosophila. This conclusion is based on the observation that the inhibition of one pathway by depleting key effectors may slightly interfere with, but does not significantly inhibit, the functioning of the other pathways. The lack of interdependence between RNAi and the miRNA pathway is further supported by the observation that knockouts of AGO1 or AGO2 in Drosophila have different phenotypes. Nevertheless, cross-talk between the RNAi and the miRNA pathways may still occur at the initiation step, since Dicer-1 plays a role in RISC assembly (Rehwinkel, 2005). Biochemical and genetic approaches in several organisms have led to the identification of essential components of the miRNA pathway. These include AGO1 and the enzymes required for miRNA processing, such as Drosha and Dicer-1 and their respective cofactors, Pasha and Loqs. However, the mechanisms by which miRNAs inhibit protein expression without affecting mRNA levels are not completely understood. Recent evidence suggests that translation initiation is inhibited and that the targeted mRNAs are stored in P-bodies, where they are maintained in a silenced state either by associating with proteins that prevent translation or possibly by removal of the cap structure. This study identified the P-body components GW182 and the DCP1:DCP2 decapping complex as proteins required for the miRNA pathway. The precise molecular mechanism by which these proteins participate in this pathway remains to be established. These proteins may have an indirect role in the miRNA pathway by affecting P-body integrity. Alternatively, these proteins may play a direct role in this pathway by escorting miRNA targets to P-bodies or facilitating mRNP remodeling steps required for the silencing of these targets. Consistent with a direct role for the DCP1:DCP2 decapping complex, and thus for the cap structure, in miRNA function is the observation that mRNAs translated via a cap-independent mechanism are not subject to miRNA-mediated silencing. In conclusion, the results uncover an important role for the P-body components, GW182 and the DCP1:DCP2 complex, in miRNA-mediated gene silencing (Rehwinkel, 2005). During Drosophila development, translational control plays a crucial role in regulating gene expression, and is particularly important during pre-patterning of the maturing oocyte. A critical step in translation initiation is the binding of the eukaryotic translation initiation factor 4E (eIF4E) to the mRNA cap structure, which ultimately leads to recruitment of the ribosome. d4EHP is a translational repressor that prevents translation initiation by out-competing eIF4E on the cap structure for a subset of mRNAs. However, only two examples of mRNAs subject to d4EHP translation repression in Drosophila are known. This study shows that the belle (bel) mRNA is translationally repressed by the d4EHP protein in the Drosophila ovary. Consistent with this regulation, d4EHP overexpression in the ovary phenocopies the bel mutant. Evidence is provided that the Bel protein binds to eIF4E and may itself function as a translation repressor protein, with bruno as a potential target for Bel repression in the oocyte. Bruno is known to repress the mRNA of the key oocyte axis determinant oskar (osk) during oogenesis, and this study found that an increase in the level of Bruno protein in bel mutant ovaries is associated with a reduction in Osk protein. Overall, these data suggest that a translational regulatory network exists in which consecutive translational repression events act to correctly pattern the Drosophila oocyte (Yarunin, 2011). Animal miRNAs silence the expression of mRNA targets through translational repression, deadenylation and subsequent mRNA degradation. Silencing requires association of miRNAs with an Argonaute protein and a GW182 family protein. In turn, GW182 proteins interact with poly(A)-binding protein (PABP) and the PAN2-PAN3 and CCR4-NOT deadenylase complexes. These interactions are required for the deadenylation and decay of miRNA targets. Recent studies have indicated that miRNAs repress translation before inducing target deadenylation and decay; however, whether translational repression and deadenylation are coupled or represent independent repressive mechanisms is unclear. Another remaining question is whether translational repression also requires GW182 proteins to interact with both PABP and deadenylases. To address these questions, this study characterized the interaction of Drosophila melanogaster GW182 with deadenylases and defined the minimal requirements for a functional GW182 protein. Functional assays in D. melanogaster and human cells indicate that miRNA-mediated translational repression and degradation are mechanistically linked and are triggered through the interactions of GW182 proteins with PABP and deadenylases (Huntzinger, 2013). Recent studies indicate that translational repression of miRNA targets precedes deadenylation and decay. This study shows that these two functional outcomes of miRNA regulation are linked and both require the interaction of GW182 proteins with PABP and deadenylases (Huntzinger, 2013). The interaction of GW182 proteins with PABP has been well documented using biochemical and structural studies, and the PAM2 motif is highly conserved among vertebrate and insect GW182 proteins. Despite conservation, the study of the role of PABP in silencing in different systems has led to conflicting conclusions. For example, several studies have reported that the PABP–GW182 interaction is important for silencing in Drosophila and human cells and in cell-free systems that recapitulate silencing. Furthermore, PABP depletion prevented miRNA-mediated deadenylation in cell-free extracts from mouse Krebs-2 ascites cells, and mutations in the PAM2 motif of TNRC6C reduced the rate of deadenylation in tethering assays. In addition, a study in Drosophila cell-free extracts wherein silencing is mediated through endogenous preloaded miRISCs indicated that PABP stimulates silencing by facilitating the association of miRISC complexes with mRNA targets. It was also shown that on miRISC binding, PABP progressively dissociated from the mRNA target, in the absence of deadenylation (Huntzinger, 2013). In contrast to the studies mentioned above, studies in zebrafish embryos and in a Drosophila cell-free assay wherein miRISCs are loaded with exogenously supplemented miRNA duplexes indicate that PABP is dispensable for miRNA-mediated silencing. Intriguingly, efficient silencing in zebrafish embryos required the GW182 PAM2 motif. Moreover, the observation that multiple and non-overlapping fragments of Drosophila GW182 (including N-term fragments that do not interact with PABP) silenced mRNA reporters in tethering assays was interpreted as evidence that the interaction of GW182 proteins with PABP is not required for silencing. This study shows that unlike in tethering assays, N-term fragments of GW182 fail to restore the silencing of a majority of the reporters tested in complementation assays. Thus, tethering assays bypass the requirement for PABP binding, and may not faithfully recapitulate silencing. Furthermore, the observation that PABP dissociates from the poly(A) tail of miRNA targets in the absence of deadenylationprovides one explanation for the occurrence of silencing in extracts in which PABP has been depleted or displaced from the poly(A) tail using an excess of Paip2 (Huntzinger, 2013). In summary, these results confirm and further extend previous observations that a single amino acid substitution in the PAM2 motif of human TNRC6 proteins abolishes PABP binding and impairs silencing activity, despite the interaction of this mutant with deadenylases. Furthermore, Drosophila GW182 N-term protein fragments that bind deadenylases, but not PABP, failed to complement the silencing of eight of the nine reporters tested, although they are active in tethering assays. These results provide evidence for a role of PABP in silencing in human and Drosophila cells. However, it is possible that PABP becomes dispensable for silencing depending on cellular conditions or the nature of the specific mRNA target, as shown, for example, for the F-Luc-Nerfin-1 reporter when silencing is mediated by miR-9b (Huntzinger, 2013). The SDs of human TNRC6 proteins directly interact with CNOT1 through tryptophan-containing motifs in the M1, M2 and C-term regions of the S. This study shows that these motifs contribute additively to CNOT1 binding and silencing activity in human cells. Indeed, when at least two motifs are simultaneously mutated, CNOT1 binding is strongly reduced and silencing activity impaired (Huntzinger, 2013). The interaction between GW182 and deadenylases is conserved in Drosophila; however, in contrast to human SDs, the Drosophila SD is not sufficient for NOT1 binding. This study shows that in addition to the SD, the Q-rich region is required for full NOT1 binding activity. Thus, although Drosophila GW182 has lost the CIM-2 motif, this protein has acquired additional motifs that can interact with NOT1. This study also shows that in contrast to the human proteins, Drosophila GW182 can interact with NOT2 and PAN3 via N-term sequences. Consequently, Drosophila GW182 can recruit deadenylases in multiple ways. Considering that (1) NOT1 interacts with NOT2, (2) the PAN2–PAN3 complex interacts with PABP and (3) the CCR4–NOT and PAN2–PAN3 complexes form a larger multiprotein complex in vivo, the current observations indicate a high degree of connectivity and redundancy within the GW182 interaction network, which could explain why mutations in individual motifs do not abolish partner binding or silencing activity, but a combination of two or more mutations is required to abrogate binding and silencing activity (Huntzinger, 2013). In addition, the ability of Drosophila GW182 N-term fragments to bind deadenylases also explains why these fragments are potent triggers of translational repression and mRNA degradation in tethering assays, whereas the corresponding fragments of the human proteins exhibit only residual activity. As discussed previously, despite their activity in tethering assays, Drosophila GW182 N-term fragments failed to complement the silencing of several of the reporters tested. The reason for the different activities of these fragments in tethering and complementation assays remains unknown (Huntzinger, 2013). This study has demonstrated that silencing (i.e. translational repression and target degradation) requires the interaction between GW182 proteins and both PABP and deadenylases. Several lines of evidence support this conclusion. First, the TNRC6C SD, which is sufficient for PABP and deadenylase binding, rescues silencing when fused to a minimal ABD. Similarly, the minimal fragment of Drosophila GW182 that rescues silencing comprises the Q+SD region, which also binds both deadenylases and PABP. Second, the Drosophila GW182 N-term fragments that bind deadenylases but not PABP are generally inactive in complementation assays. Third, mutations that specifically disrupt TNRC6 binding to PABP or deadenylase impair silencing, and mutations that disrupt deadenylase binding exhibit a stronger deleterious effect. Silencing activity is abolished when these mutations are combined. Finally, silencing is inhibited in human cells overexpressing the CNOT1 Mid domain together with a catalytically inactive CNOT7 mutant. In combination with the previously published data, these results indicate that silencing minimally requires an AGO, a GW182 protein, PABP and deadenylases, thus defining the minimal interaction network required for silencing. The findings do not rule out that additional interactions are potentially required to achieve maximal repression, depending on the cellular context or the mRNA target. For example, the P-GL motif is highly conserved and important for silencing in zebrafish embryos. This motif may mediate interactions with additional partners (Huntzinger, 2013). The finding that deadenylase complexes, in particular, are required for miRNA-mediated translational repression has broad implications regarding post-transcriptional mRNA regulation. Indeed, in addition to the GW182 proteins, various sequence-specific mRNA-binding proteins, such as Nanos, Bicaudal-C and Pumilio, recruit the CCR4–NOT complex to their mRNA targets. Furthermore, the direct tethering of the subunits of the CCR4–NOT complex represses the translation of mRNA reporters lacking a poly(A) tail, suggesting that the CCR4–NOT complex promotes translational repression in the absence of deadenylation. Therefore, elucidating the mechanism by which the CCR4–NOT complex regulates the fates of mRNA targets promises to increase understanding of the mechanism underlying repression by miRNAs and diverse sequence-specific RNA-binding proteins (Huntzinger, 2013). In the sexually reproductive organisms, gametes are produced by meiosis following a limited mitotic amplification. However, the intrinsic program switching cells from mitotic to meiotic cycle is unclear. Alternative polyadenylation (APA) is a highly conserved means of gene regulation and is achieved by the RNA 3'-processing machinery to generate diverse 3'UTR profiles. In Drosophila spermatogenesis, this study observed distinct profiles of transcriptome-wide 3'UTR between mitotic and meiotic cells. In mutant germ cells stuck in mitosis, 3'UTRs of hundreds of genes were consistently shifted. Remarkably, altering the levels of multiple 3'-processing factors disrupted germline's progression to meiosis, indicative of APA's active role in this transition. An RNA-binding protein (RBP) Tut could directly bind 3'UTRs of 3'-processing factors whose expressions were repressed in the presence of Tut-containing complex. Further, this RBP complex could execute the repression post-transcriptionally by recruiting CCR4/Twin of deadenylation complex. Thus, it is proposed that an RBP complex regulates the dynamic APA profile to promote the mitosis-to-meiosis transition (Shan, 2017). Human (Hs) Roquin1 and Roquin2 are RNA-binding proteins that promote mRNA target degradation through the recruitment of the CCR4-NOT deadenylase complex and are implicated in the prevention of autoimmunity. Roquin1 recruits CCR4-NOT via a C-terminal region that is not conserved in Roquin2 or in invertebrate Roquin. This study shows that Roquin2 and Drosophila melanogaster (Dm) Roquin also interact with the CCR4-NOT complex through their C-terminal regions. The C-terminal region of Dm Roquin contains multiple motifs that mediate CCR4-NOT binding. One motif binds to the CAF40 subunit of the CCR4-NOT complex. The crystal structure of the Dm Roquin CAF40-binding motif (CBM) bound to CAF40 reveals that the CBM adopts an α-helical conformation upon binding to a conserved surface of CAF40. Thus, despite the lack of sequence conservation, the C-terminal regions of Roquin proteins act as an effector domain that represses the expression of mRNA targets via recruitment of the CCR4-NOT complex (Sgromo, 2017). The eukaryotic porin, also called the Voltage Dependent Anion-selective Channel (VDAC), is the main pore-forming protein of the outer mitochondrial membrane. In Drosophila melanogaster, a cluster of genes evolutionarily linked to VDAC is present on chromosome 2L. The main VDAC isoform, called VDAC1 (Porin1), is expressed from the first gene of the cluster. The porin1 gene produces two splice variants, 1A-VDAC and 1B-VDAC, with the same coding sequence but different 5' untranslated regions (UTRs). The influence of the two 5' UTRs, 1A-5' UTR and 1B-5' UTR, was studied on transcription and translation of VDAC1 mRNAs. In porin-less yeast cells, transformation with a construct carrying 1A-VDAC results in the expression of the corresponding protein and in complementation of a defective cell phenotype, whereas the 1B-VDAC sequence actively represses VDAC expression. Identical results were obtained using constructs containing the two 5' UTRs upstream of the GFP reporter. A short region of 15 nucleotides in the 1B-5' UTR should be able to pair with an exposed helix of 18S ribosomal RNA (rRNA), and this interaction could be involved in the translational repression. These data suggest that contacts between the 5' UTR and 18S rRNA sequences could modulate the translation of Drosophila 1B-VDAC mRNA. The evolutionary significance of this finding is discussed (Leggio, 2018). This work focused on the regulation of expression of VDAC1 in D. melanogaster. In this species, the porin1 gene produces two alternative transcripts named 1A-VDAC and 1B-VDAC, containing an identical coding sequence but two completely different 5' UTRs. To gain further insights into the biological function of these two alternative splicing forms of VDAC, they were introduced into a VDAC-lacking system, an established S. cerevisiae strain where the porin1 gene was inactivated (δpor1 strain). The advantage of the yeast cell is its viability (under fermentative conditions), whereas D. melanogaster cells cannot survive the deletion of the VDAC1 gene (Leggio, 2018). In δpor1 yeast, the heterologous 1A-5' UTR directed transcription and translation of VDAC and of GFP used as a reporter; in contrast, the 1B-5' UTR directed the transcription but not the translation of the VDAC or the reporter gene. These results confirm that only the 1A-VDAC, but not the 1B-VDAC, is able to complement the growth defect of the δpor1 yeast cells. Similar data were obtained in Drosophila cells by using a luciferase reporter gene downstream of the 1A- or 1B-5' UTR. These results suggest that the 1B-5' UTR affects VDAC expression by inhibiting protein translation. Furthermore, the results suggest that this mechanism is independent of the coding region cloned downstream of the 5'-UTR (Leggio, 2018). This study aimed to understand the mechanism responsible for the negative influence of the 1B-5' UTR on the translation of the coding sequences fused downstream. Gene expression in eukaryotic cells is regulated at multiple levels, including mRNA translation. Such control allows rapid changes in protein concentrations and, thus, it is used to maintain cellular homeostasis. Most translation regulation is exerted at the very first stage, when the AUG start codon is identified after the 5' UTR ribosome scanning. Consequently, any occurrence that prevents or inhibits the ability of the ribosome to scan the 5' UTR reduces the efficiency of translation initiation. Mechanisms that produce this effect are well known. Therefore, some of these were assayed, such as the presence of uORFs or stable secondary structures and the association with regulatory RBPs (Leggio, 2018). The possibility was ruled out that the small upstream ORF (uORF) located in the 1B sequence is involved in translational control. Bioinformatic analysis suggested that no putative strong secondary structure in the untranslated region of 1B-VDAC mRNA should be involved in the inhibition of translation. In addition, bioinformatic predictive analysis of RBPs showed that there is no known RBP specific for the 1B-5' UTR, within the limitations of computational tools. Moreover, the possible involvement of miRNAs was not considered, because the 3' UTR of 1B-VDAC is included in the corresponding 3' UTR of 1A-VDAC, which is longer. Therefore, because a regulatory mechanism involving a miRNA action targeted to this region of 1B-VDAC mRNA could not be specific for the 1B-mRNA, this mechanism was ruled out (Leggio, 2018). Using a mutagenesis scanning approach, the 16-31 nucleotide region of the 1B-5' UTR sequence was identified as responsible in yeast for the inhibitory effect on translation. The defect in the growth of the δpor1 yeast strain was indeed complemented when the strain was transformed with 1B(Δ16-31)-VDAC mutant, underlining that its removal is sufficient to re-establish the translation. It was also verified that the 16-31 sequence works similarly in Drosophila, although the translation inhibition must rely also on others factors. Therefore, by MS analysis of the proteins bound to an RNA oligo containing the 10-34 sequence of the 1B-5' UTR, proteins were sought that were directly or indirectly involved in the translation control. In particular, eIF4A, eIF5a and Asc1 were recognized. eIF4A is a RNA helicase working in the first stage of translation as a subunit of the cap-binding complex eIF4F, which unwinds the RNA secondary structures in the 5' UTR. Asc1/RACK1 associates with the 40S subunit close to the mRNA exit channel, where it interacts with eIF4E of eIF4F51. Asc1/RACK1 is involved in the control of the translation of housekeeping genes and, in general, represses gene expression. It is known that RACK1 loss-of-function mutations cause early developmental lethality in the mouse and the fly, like VDAC knockout organisms. Moreover, in yeast, loss of ASC1 reduces translation of mitochondrial r-proteins and, like for lack of VDAC1, causes cells to be unable to use non-fermentable carbon sources, demonstrating a direct control of ASC1 on mitochondria functionality. Interestingly, RACK1 has many interaction partners, ranging from kinases and signalling proteins to membrane-bound receptors and ion channels. Thus, under stress conditions, RACK1 can function as a signalling hub of newly synthesised proteins (Leggio, 2018). From this viewpoint, it can be hypothesised that in yeast the 16-31 sequence might prevents eIF4A function, maybe trapping eIF4A in an inactive conformation. In Drosophila, 1B-VDAC translation could be repressed at the starting point by the coordinated action of more molecules, probably recruited in situ by RACK1. Gus1, which together with Arc1, is known to form a protein complex operating in the control of translation, was identified. In addition, the presence of two different heat-shock proteins (Hsp12 and Hsp76) in this pool of interacting proteins should indicate their recruitment after stress conditions (Leggio, 2018). The ability of the 1A- and 1B-5' UTR sequences to contact protein-free domains of 18S rRNA, the only rRNA in the 40S subunit, was also tested. Because 18S rRNA mutations impair the integrity of the scanning-competent pre-initiation complex and/or its joining together with the 60S subunit, the translation initiation rate might be reduced by strong and long-range interactions between the protein-free domains of 18S rRNA and the 5' UTR(s) of the incoming mRNA. It has already been demonstrated in eukaryotes that gene expression regulation at the level of translation may occur thanks to specific interactions between mRNAs and rRNA domains. In particular, a highly specific sequence complementarity between 18S rRNA and the 5' UTRs of mRNAs across species has been predicted; this complementarity may modulate the scanning processivity of the 40S subunit through the 5' UTR of mRNAs, which could even stall the initiating PICs in the case of long-range interactions (Leggio, 2018). In particular, by prediction analysis of RNA:RNA interactions between yeast 18S rRNA and the two alternative D. melanogaster VDAC mRNAs (1A-VDAC and 1B-VDAC), it was found that, in yeast as in D. melanogaster, almost the whole 1B-5'UTR sequence is able to strongly interact with a long sequence of 18S rRNA. In contrast, the 1B(Δ16-31)-5'UTR sequence can only weakly interact with a short sequence of rRNA in the 40S subunit, thus showing a behaviour similar to that 1A-5' UTR. These results underline the relevance of 1B-5' UTR and, in particular in yeast, of its 16-31 sequence for the mechanism of translation control. Interestingly, it was also found that some regions of the rRNA sequence involved in the interaction with the 1B-5' UTR fold in solvent-exposed domains, and some of them are turned towards the mRNA path of the ribosome 40S subunit. Therefore, these rRNA domains should be able to contact the 5' UTR in the incoming 1B-VDAC mRNA, producing a stop in the ribosome scanning. It is noteworthy that a sequence of about 35 nucleotides can be allocated inside the ribosomal mRNA path of PIC and that it was found that almost the whole 1B-5' UTR sequence, (2-116 nucleotides), may potentially interact with three 18S rRNA helices (helix 35, helix 36 and a portion of the helix 34) arranged near the mRNA path at the neck of 40S. In addition, the large helix 33, together with parts of helix 31 and helix 32, being arranged at the beck of the 40S subunit, could easily interact with the 1B-5' UTR. In this way, the 1B-VDAC mRNA translation rate would be negatively controlled by its 5' UTR sequence through the collective action of several interactions with 18S rRNA, the result of which would be a strong delay in ribosome scanning of 1B-VDAC. Probably, this effect in Drosophila could also be the result of additional interactions with fly-specific proteins, ribosomal or not. In any case, it is extremely relevant that the sequences encompassing these rRNA helices are highly conserved between S. cerevisiae and D. melanogaster; this indicates that the mechanism described in the mixed yeast-fly system is likely to act in D. melanogaster (Leggio, 2018). VDAC is an essential but dangerous protein. Its function as a pro-apoptotic factor is well known and therefore it is essential for the cell to implement a suitable control of VDAC protein level. Also, specific conditions of cell growth involving high energy demand are known to induce up-regulation of VDAC associated with the requirement of mitochondrial biogenesis. Furthermore, these events must be coordinated with the expression of the other mitochondrial proteins, codified by the nuclear genome and from mitochondrial DNA. Therefore, it is conceivable to suppose the presence in the cell of a 'sentry' molecule able to sense, directly or indirectly, the amount of this crucial protein. It was demonstrated that in Drosophila the level of 1B-VDAC transcript is highly increased as a result of overexpression of 1A-VDAC mRNA. When the level of the 1B-VDAC transcript was increased by its overexpression, the endogenous 1A-VDAC mRNA level was meaningfully reduced. Importantly, the results show that the unproductive 1B-VDAC mRNA is able to respond to 1A-VDAC transcript levels, and thus it might work as a molecule signalling the need for activation of mitochondrial biogenesis. This hypothetical role of 1B-VDAC mRNA is supported by its interaction with Asc1/RACK1. Asc1/RACK1 responds to multiple signals, and might act to coordinate the expression of other mitochondrial proteins and thus affect cell respiration (Leggio, 2018). In addition, the assignment of this important role to 1B-VDAC mRNA might lead to an understanding of why the evolution of the Drosophila genus proceeded towards the acquisition of an alternative 5' UTR with specific features (Leggio, 2018). In conclusion, these results extend earlier reports and provide further evidence that in D. melanogaster the 1A-VDAC transcript is responsible for protein expression, while the alternative 1B-VDAC mRNA is not active in this respect. Moreover, this work showd that a specific mechanism could be responsible for the translation inhibition of the alternative D. melanogaster 1B-VDAC1 transcript (Leggio, 2018).